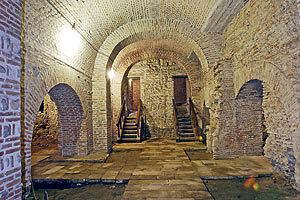 » Upcoming Dracula themed tours » Who was Vlad Dracula ? Some say that Transylvania sits on one of Earth's strongest magnetic fields and its people have extra-sensory perception. Vampires are believed to hang around crossroads on St. George's Day, April 23, and the eve of St. Andrew, November 29. The area is also home to Bram Stoker's Dracula, and it's easy to get caught up in the tale while driving along winding roads through dense, dark, ancient forests and over mountain passes. Tales of the supernatural had been circulating in Romanian folklore for centuries when Irish writer Bram Stoker picked up the thread and spun it into a golden tale of ghoulishness that has never been out of print since its first publication in 1897. To research his immortal tale, Stoker immersed himself in the history, lore and legends of Transylvania, which he called a "whirlpool for the imagination." Bram Stoker's Dracula novel was published in Romanian for the first time in 1990. Travel Journal: "In the Footsteps of Dracula." Other Dracula sites include: the Old Princely Court (Palatul Curtea Veche) in Bucharest, Snagov Monastery, where, according to legend, Vlad's remains were buried; the ruins of the Poenari Fortress (considered to be the authentic Dracula's Castle); the village of Arefu where Dracula legends are still told, the city of Brasov where Vlad led raids against the Saxons merchants, and, of course, Bran Castle. 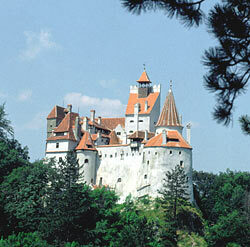 Some tours also cover the folkloric aspects of the fictional Dracula. For instance, visitors can eat the exact meal Jonathan Harker ate at The Golden Crown in Bistrita and sleep at Castle Dracula Hotel, built no so long ago on the Borgo Pass at the approximate site of the fictional Count's castle. Known for its wide, tree-lined boulevards, glorious Belle Époque buildings and a reputation for the high life (which in the 1900s earned its nickname of "Little Paris"), Bucharest, Romania's largest city and capital, is today a bustling metropolis. Bucharest is laden with historical charm – from the streets of the Old City Center, which are slowly being restored, to the grand architecture of the Royal Palace and the lush green of Cismigiu Park. The city also claims a large number of museums, art galleries, exquisite Orthodox churches and unique architectural sites (find out more about Bucharest). The Old Court Museum was established in 1972 when an archaeological dig revealed the remains of the fortress, along with Dacian pottery and Roman coins, evidence of Bucharest's earliest inhabitants. The oldest document attesting to the city's origin under the name of Bucuresti was discovered here. It was issued on September 20, 1459 and signed by Prince Vlad Tepes. In 1458 - more than one hundred years after the church was built (1364) - Romanian prince Vlad Tepes (Vlad the Impaler) added thick defending walls and a dungeon. A plaque on the floor inside the church marks the grave with the presumed remains of the world-known count. The monastery is located on an island on lake Snagov, and can be accessed on a pedestrian bridge or by boat. Open: Tue. – Sun. 9:00 a.m. – 7 p.m.; Closed Mon. 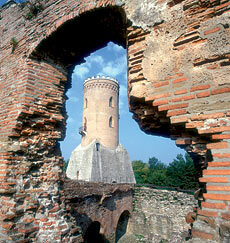 In Targoviste, tour the 14th century Princely Court and Chindiei Watchtower (Turnul Chindiei). The Princely Court served as the capital of Walachia, where Vlad ruled. It was here that the Prince impaled a great many disloyal court members (the boyars) after inviting them to a celebratory feast. Chindiei Watchtower now houses an exhibition illustrating Vlad's life. Vlad recognized the potential of the location and upon taking over the throne, he ordered that the structure be repaired and consolidated, turning it into one of his main fortresses. When the Turks attacked and captured the castle in 1462, Vlad escaped via a secret passageway leading north through the mountains. Although the castle was used for many years after Vlad's death in 1476, it was eventually abandoned again in the first half of the 16th century and left to the ravages of time and weather. In 1888, a major landslide brought down a portion of the castle which crashed into the river far below. The castle underwent repairs and the remnants of its walls and towers stand to this day. You will need stamina to climb the 1,462 steps to reach the castle ruins, perched high above the surrounding area like an eagle's nest. Next visit Arefu, where many of the villagers trace their ancestry back to the loyal minions of Vlad Tepes himself (in the movies, these are the ones who are always busy loading up Dracula's coffins with Transylvanian earth). Legend has it that when the Turks attacked and took over the Poenari Castle in 1462, it was the villagers of Arefu who helped Vlad escape. Spend the night with the locals camping around a fire and listening to centuries-old folk tales. Homestays and B&Bs are available in Arefu and nearby villages. 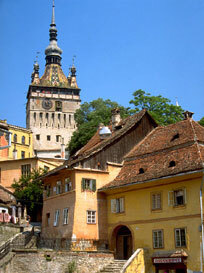 (find out more about Sighisoara). 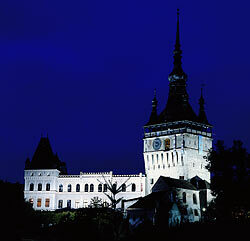 The Vlad Dracul House is located in Sighisoara's Citadel Square, close to the Clock Tower. This ocher-colored house is the place where Vlad Tepes, the inspiration for Bram Stoker's famous Dracula, was born in 1431 and lived with his father, Vlad Dracul (read more about the story of the Dracul name), until 1435 when they moved to Targoviste. A wrought-iron dragon hangs above the entrance. The ground floor of the house serves as a restaurant, while the first floor is home to the Museum of Weapons. Located at the foot of the Bargau Mountains, not far from the Borgo Pass (Pasul Tihuta in Romanian) which connects the provinces of Transylvania and Moldavia, the town of Bistrita is one of the oldest in the region. Archeological findings indicate that the area has been inhabited since the Neolithic age, long before Bram Stocker chose it as the setting of his fictional Dracula's castle. In Bram Stoker's novel, Dracula, a young Englishman, Jonathan Harker, visits Bistrita and spends a night at the Golden Krone Hotel (Hotelul Coroana de Aur) on the eve of St. George's Day before continuing his journey east to Count Dracula's castle. Although no such hotel existed when the novel was written, a hotel with the same name has since been constructed for visitors. Saxon colonists, who settled here in 1206, helped develop the town into a flourishing medieval trading post. First mentioned in 1264 as Villa Bistiche, the name was later changed to Civitas Bysterce. Soon enough, Bistritz, as it was known to its German inhabitants, became one of Transylvania's most important Saxon citadels (Siebenbürgens*). Today, the old town's quaint 15th and 16th century merchants' houses, the remains of the 13th century fortress walls and a generally unhurried pace have preserved some of Bistrita's medieval atmosphere (find out more about Bistrita). Borgo Pass (Bargau in Romanian), made famous in the opening chapter of Bram Stoker's Dracula, is an oft-trod passageway through the Carpathian Mountains in northern Transylvania. Located near the small township of Tihuta, the pass peaks at 3,840 feet. The Bargau Valley encompasses some of the most beautiful unspoiled mountain scenery in the Carpathians with picturesque traditional villages located in valleys and on hillsides, ideal bases for hiking, riding or discovering their vivid tapestry of old customs, handicrafts and folklore. Here, you will step into a realm that the fictional Mina Harker described in her diary as "a lovely county; full of beauties of all imaginable kinds, and the people are brave, and strong, and simple, and seem full of nice qualities." Moreover, the ceremonial uniform of the Order – black cloak over red accouterment – was Bram Stocker' source of inspiration for Count Dracula's look. But how did Bram Stoker's story turn into a myth? A partial explanation is provided by the circumstances under which the book was written and received. A genuine epidemic of "vampirism" had hit Eastern Europe at the end of the 17th century and continued throughout the 18th century. The number of reported cases soared dramatically, especially in the Balkans. Then, the epidemic traveled west to Germany, Italy, France, England and Spain. Travelers returning from the East would tell stories about the undead, which helped keep the interest in vampires alive. Western philosophers and artists tackled the issue ever more often. Bram Stoker's novel came as the pinnacle of a long series of works based on tales coming from the East. Back then, most readers were certain that the novel had been inspired by real facts and that its story was perhaps just a bit romanticized. Dracula is more than 100 years old and still alive! Of course, almost everybody has heard about this Nosferatu: through movies featuring Max Schreck, Bela Lugosi, Christopher Lee or Gary Oldman; in several books, including the recent Vampire Chronicles of Anne Rice, or even in bedtime stories told to us in our childhood. We all have an idea of who or what the Count is. However, on the other hand, Vlad Tepes (Dracula), the historical figure who inspired Bram Stoker's novel, is definitely less well-known. 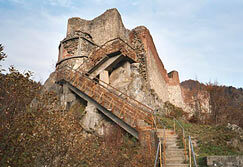 Vlad Tepes was born in December 1431 in the fortress of Sighisoara, Romania. 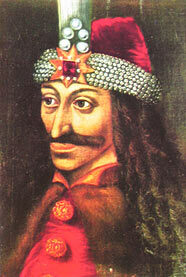 Vlad's father, governor of Transylvania, had been inducted into the Order of the Dragon about one year before. The order — which could be compared to the Knights of the Hospital of St. John or even to the Teutonic Order of Knights — was a semi-military and religious society, originally created in 1387 by the Holy Roman Emperor and his second wife, Barbara Cilli. The main goal of such a secret fraternal order of knights was to protect the interests of Christianity and to crusade against the Turks. The boyars of Romania associated the dragon with the Devil and decided to call Vlad's father "Dracul," which in the Romanian language means "Devil;" "Dracula" is a diminutive, meaning "the son of the Devil." In the winter of 1436-1437, Dracul became prince of Walachia (one of the three Romanian provinces) and took up residence at the palace of Targoviste, the princely capital. Vlad followed his father and lived six years at the princely court. In 1442, in order to keep the Turks at bay, Dracul sent his son, Vlad, and his younger brother, Radu, to Constantinople (today Istanbul) as hostages of the Sultan Murad II. Vlad was held there until 1448. This Turkish captivity surely played an important role in Dracula's upbringing; it must be at this period that he adopted a very pessimistic view of life and learned the Turkish method of impalement on stakes. The Turks set Vlad free after informing him of his father's assassination in 1447. He also learned about his older brother's death and how he had been tortured and buried alive by the boyars of Targoviste. Vlad Tepes adopted the method of impaling criminals and enemies and raising them aloft in the town square for all to see. Almost any crime, from lying and stealing to killing, could be punished by impalement. Being so confident in the effectiveness of his law, Dracula placed a golden cup on display in the central square of Targoviste. The cup could be used by thirsty travelers, but had to remain on the square. According to the available historical sources, it was never stolen and remained entirely unmolested throughout Vlad's reign. Crime and corruption ceased; commerce and culture thrived, and many Romanians to this day view Vlad Tepes as a hero for his fierce insistence on honesty and order. It's worth mentioning that most written sources regarding his reign are based on the numerous propagandistic pamphlets spread by the Germans with the help of their new invention, the printing press. In the beginning of 1462, Vlad launched a campaign against the Turks along the Danube River. It was quite risky, the military force of Sultan Mehmed II being by far more powerful than the Walachian army. However, during the winter of 1462, Vlad was very successful and managed to gain several victories. To punish Dracula, the Sultan decided to launch a full-scale invasion of Walachia. His other goal was to transform this land into a Turkish province. He entered Walachia with an army three times larger than Dracula's. Finding himself without allies and forced to retreat towards Targoviste, Vlad burned his own villages and poisoned the wells along the way, so that the Turkish army would find nothing to eat or drink. Moreover, when the Sultan, exhausted, finally reached the capital city, he was confronted by a most gruesome sight: hundreds of stakes held the remaining carcasses of Turkish captives, a horror scene which was ultimately nicknamed the "Forest of the Impaled." This terror tactic, deliberately stage-managed by Dracula, was definitely successful. The scene had a strong effect on Mehmed's most stout-hearted officers, and the Sultan, tired and hungry, decided to withdraw (it is worth mentioning that even Victor Hugo, in his Legende des Siecles, recalls this particular incident). Nevertheless, following his retreat from Walachian territory, Mehmed encouraged and supported Vlad's younger brother, Radu, to take the Walachian throne. At the head of a Turkish army and joined by Vlad's detractors, Radu pursued his brother to Poenari Castle on the Arges River. According to legend, this is when Dracula's wife, in order to escape capture, committed suicide by hurling herself from the upper battlements, her body falling down the precipice into the river below, a scene exploited by Francis Ford Coppola's production. Vlad, who was definitely not the kind of man to kill himself, managed to escape the siege of his fortress by using a secret passage into the mountain. He was, however, assassinated toward the end of December 1476. The only real link between the historical Dracula (1431-1476) and the modern literary myth of the vampire is the 1897 novel. Bram Stoker built his fictional character solely based on the research that he conducted in libraries in London. Political detractors and Saxon merchants, unhappy with the new trade regulations imposed by Vlad, did everything they could to blacken his reputation. They produced and disseminated throughout Western Europe exaggerated stories and illustrations about Vlad's cruelty. Vlad Tepes' reign was, however, presented in a different way in chronicles written in other parts of Europe. (Excerpts from a feature published in Issue #5 of Journal of the Dark, by Benjamin Leblanc). Did Bram Stoker base his Dracula upon Vlad the Impaler?